The fourth-down call everyone in State College and Columbus is still talking about had a chance to work, but the tape shows it came down to execution on both sides. Four days later, the fallout from Penn State’s failed fourth-down conversion attempt still lingers. Ohio State stuffed Miles Sanders’s fourth-and-five run to preserve a 27–26 victory that should impact college football’s postseason more than the average September top-10 clash. Questions linger. Why did the Nittany Lions choose that play? Why didn’t it work? Who deserves credit and blame for the biggest play of the season’s first month? These questions do have answers, some of them complicated. Based off conversations with a handful of experts, we try to unpack those answers in four sections below, explaining 1) how the presnap shifting eventually resulted in confusion on the Penn State offensive line; 2) why the option Penn State chose broke down; 3) what could have happened had quarterback Trace McSorley pulled the ball out of Sanders’s midsection and 4) whether James Franklin and offensive coordinator Ricky Rahne’s play-calling tendencies helped or hurt the Nittany Lions’ chances. A chess match unfolds before the snap. Ohio State coach Urban Meyer called timeout after seeing Penn State’s formation, and the Buckeyes came back out with a fourth down lineman in their defensive front. As a reaction to the change, Franklin took a timeout, and Penn State returned to the field aligned in the pistol, with Sanders behind McSorley. Then, just before the snap, they shifted back into their original formation, with Sanders aligned next to McSorley in the shotgun. This is a zone-read with a bubble screen as a decoy third option. To many defensive coordinators, this play works like an inverted triple option that could result in a McSorley keeper, a Sanders dive or a bubble screen to slot receiver Mac Hippenhammer. 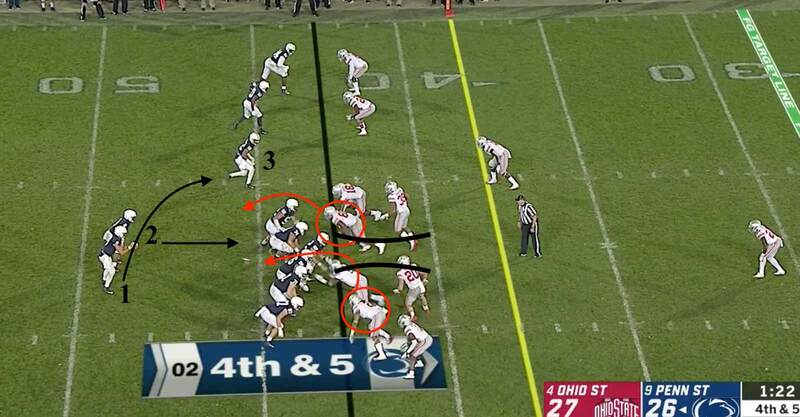 The Nittany Lions like the way Ohio State’s front is positioned in the above photo. It gives them what McSorley called a “crease” up the middle, indicated by the black alley bars. The problem: Sanders can’t reach the alley because of a twist executed by Ohio State end Chase Young, and McSorley cannot keep the ball to the outside because of the presence of Ohio State tackle Dre’Mont Jones (both are circled in red in the above screenshot). Left tackle Ryan Bates misses Jones, and right tackle Will Fries and right guard Connor McGovern do not pick up the twist by Young. A presumed third missed assignment is highlighted in the white square, which incorporates left guard Steven Gonzalez and OSU linebacker Malik Harrison. If Young doesn’t make the tackle on Sanders, the unblocked Harrison has a shot, as does linebacker Peter Werner, who a half-second later sheds his block from PSU center Michal Menet (just under the white box). 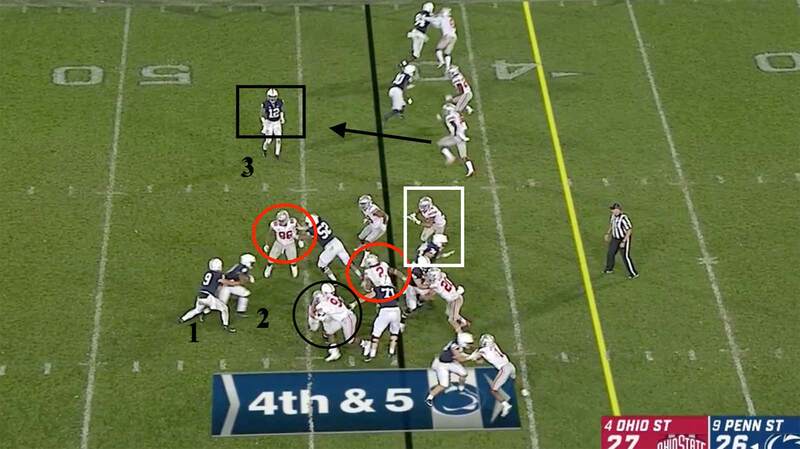 DiNardo notes that the real key to the play is Ohio State DT Jashon Cornell, circled in black, who grabs McGovern, the right guard, opening a hole for the twist from Young. “He’s tackling the guard so the guard can’t block [Young],” DiNardo says. That leaves right tackle Fries (No. 71) responsible, and he’s unable to physically make the play. This play was doomed every which way, but especially up the middle, where PSU was outnumbered 6–7 in blockers to defenders. That’s probably why Franklin admitted that it was a poor play call afterward. So how likely is it that Ohio State saw this play coming? On 15 third downs of four to six yards this season, Penn State has put the ball in McSorley’s hands, to run or pass, 11 times. Only three of those 11 opportunities were converted into a first down. Three of the four non-McSorley attempts were picked up on the ground by a running back, including a Sanders 12-yard rush against Appalachian State.